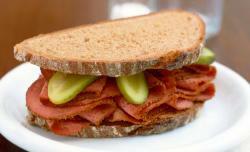 Deli Summit: Notes from the first-ever gathering of the new guard of Jewish food. Notes from the first-ever Deli Summit. Noah and Ken met up last summer, at a JCC in Berkeley, Calif., to discuss the future of pastrami-on-rye, at the first-ever Deli Summit. Joined by the other cool deli kids—Evan Bloom and Leo Beckerman of San Francisco’s wildly popular Wise Sons, and hosts Peter Levitt and Karen Adelman, co-owners of Saul’s Deli, down the street—it was a meet-and-greet of the self-anointed New Guard: deli artisans who brine/pickle/cure/smoke/hand-slice their-own-everything; serve only humanely raised, hormone-free meat; and could care less about kosher. “They’re all big guys,” said Rae. Before show time, the speakers assembled in the back office to discuss what to discuss. “Bacon?” someone proposed. “Ooh, don’t go there …” warned Noah. “The Tablet ripped on us!” “I could tell my favorite joke,” proposed Ken. “What’s the biggest Jewish dilemma? Half-price sale on pork.” “Butter versus shmaltz?” someone suggested. “Oo, yeah, Shmaltz! Good one,” said Wise Sons’ Evan Bloom. Third-choice moderator Joan Nathan, the prolific Jewish cookbook author with a perfectly coiffed pouf and an encyclopedic knowledge of kugel, kicked things off. “Tell us your pastrami conundrums.” Noah detailed his intricate sourcing and smoking process. “People don’t understand why I sometimes run out of meat. I can’t just call up Donny over at the plant and order more.” “At least you’re not dealing with a population that’s 75 percent vegan!” said Ken, from Portland. “We do a veggie Reuben,” offered Evan. Cheers and applause erupted from the Berkeley audience. “Katz’s isn’t a deli,” muttered Joan. At an invite-only after-party at Saul’s, the panelists clinked glasses of Côte Du Rhône and passed platters of potato latkes and bowls of rhubarb-and-carrot tsimmis. “We all have different philosophies of pastrami-ama,” said Karen, “but for deli’s survival, it’s important that we stick together.” Every member of the New Guard agreed. But with his new book out, especially, “I feel this unique responsibility,” says the 30-year-old cook who—unlike Ken—has admittedly packed on a few pounds since leaving law school to, unintentionally, carry a torch. “Together, we, you know, kind of represent the future of Jewish food.” So he dissed the celebrity chefs to stick with his peeps. Correction, Sept. 17, 2012: This article described Karen Adelman, the co-owner of Saul’s Deli, as 5-foot-1. She is 5-foot-3.